Experience has taught me to forget those days which, although sunny, can be too cool or too windy to achieve satisfactory results. Tuesday was neither too cool or too windy but still disappointed. A lesson learned a few years back was to allow at least a day of sunshine before venturing out. 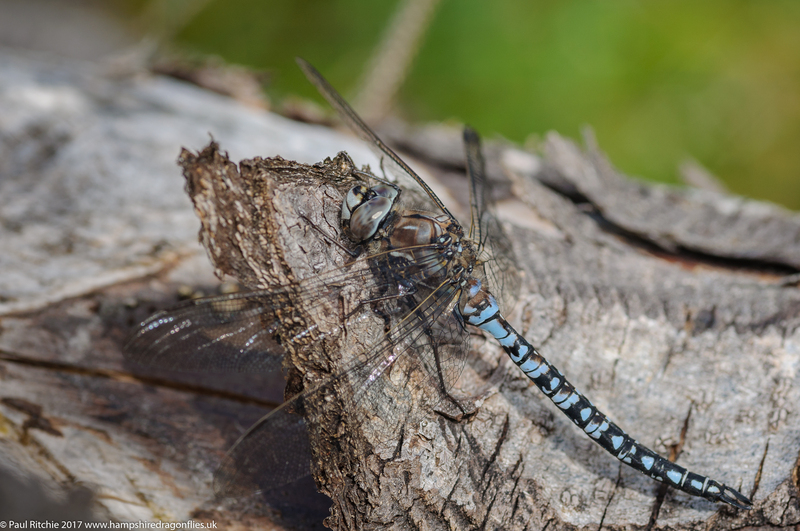 Of course cabin fever drives ambition and after several disappointing days of inclement weather the sun broke through, and I decided to take a trip to Priddy Mineries to connect with a favourite, the Moorland (Common) Hawker (Aeshna juncea to sticklers). The journey, naturally delayed before I even left Southampton, was predictably slow due to the granny chariots choosing to leave at the same time as yours truly to do whatever they choose to do. Hold up traffic on the A36 perhaps? Thankfully the journey is part of the experience, and the chance to drive through delightful countryside whilst stepping back in time to a slower pace of life should at least be rewarded with a pot of gold at the end of a rainbow? Unfortunately not today. The weather was perfect; just the occasional light, white whispers of cloud adjusting the temperature comfortably and allowing the Emperors to cease their endless patrols and perch up for a short while. They certainly needed it! Every single male I saw were battle-scared and tired after a long session of territorial disputes with their own and others. Likewise the Chaser and Skimmers. 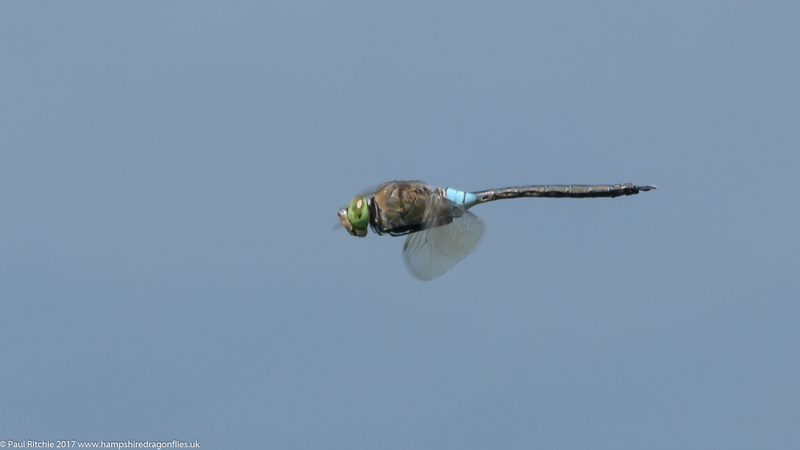 Only the Darters looked pristine; Ruddy, Black and Common at the start of their dominance. Talking of Skimmers I found a male Keeled at the boggy corner, the first time I have seen this species at this site and good news for Somerset to potentially have a new colony. 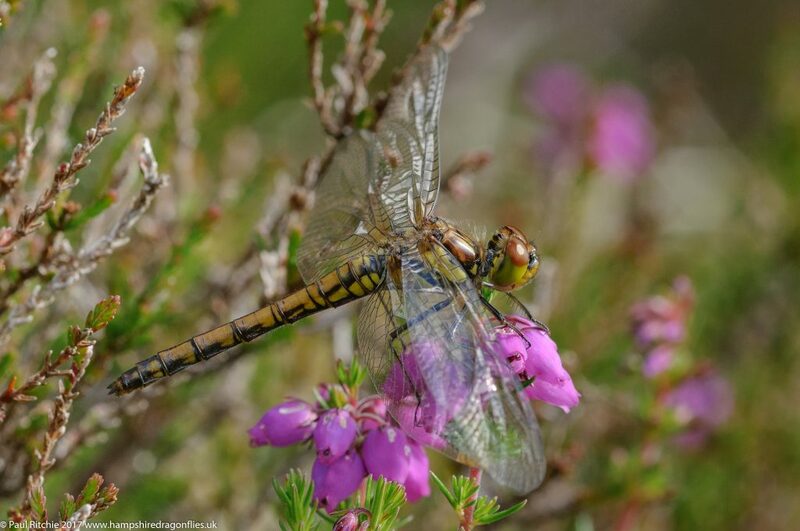 I chose today because a few years back we had the most spectacular display of Moorland Hawkers around the boggy corner. 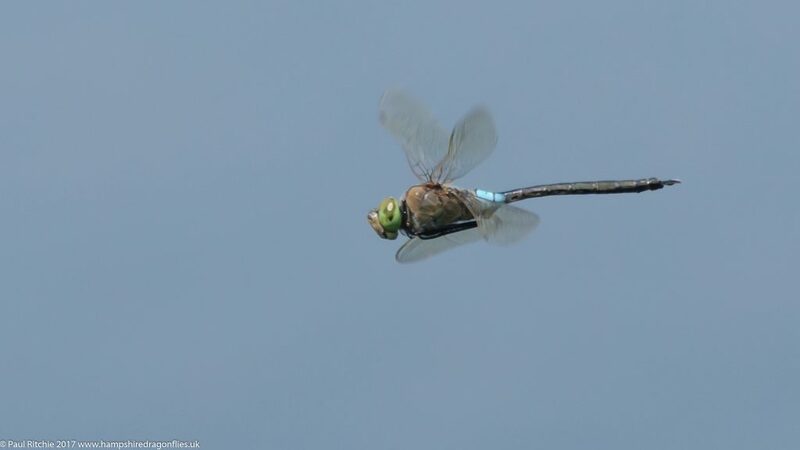 As it was there was only a brief showing of a male here, another at the entrance, a couple way too far over water for engagement and a female tentatively ovipositing around the margins. I must have surrounded the pond half-a-dozen times looking for agreeable subjects and I even popped across the road into the woods in case they were hiding out. 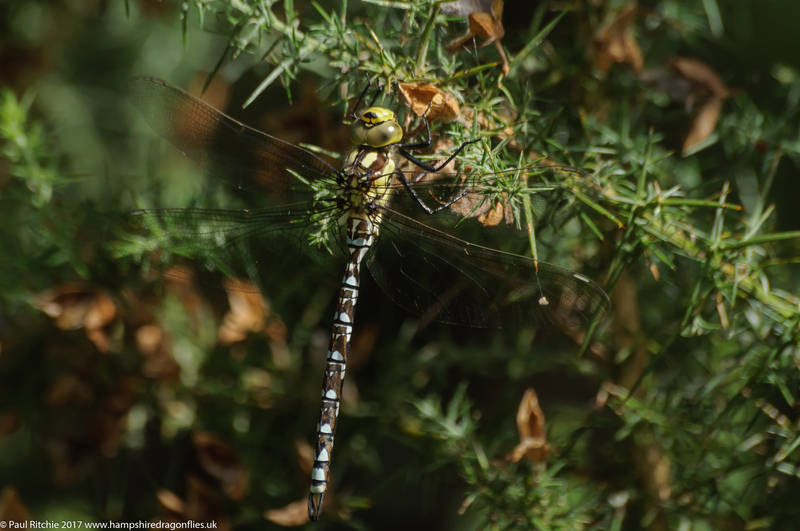 Two Migrant Hawkers were; a male and female hunting along the treeline, both immature and not ready for the pond just yet. It was gone lunchtime before I found a Moorland I could engage with. 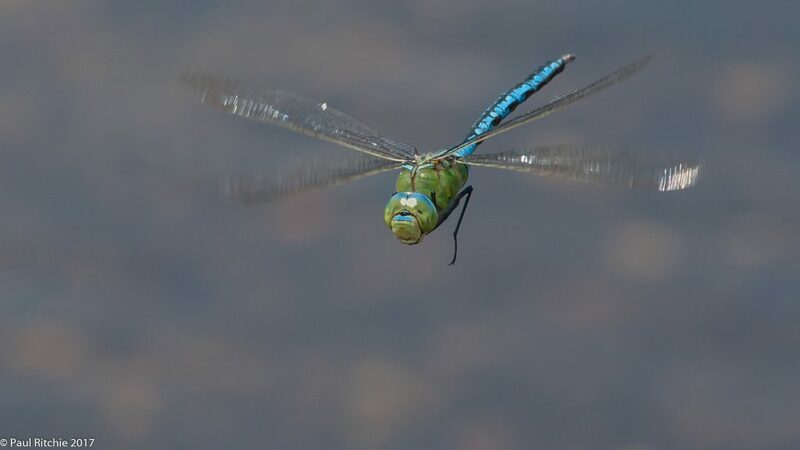 His territory patrol consisted of flying out in a descending arc towards the center of the pond from the margins, rinse, repeat and occasionally come into shore to start his descent from the treeline. Difficult to pick out against the foliage, the contrast played havoc with the light meter – remember you don’t have time to adjust when tracking – resulted in a rather pleasing image. 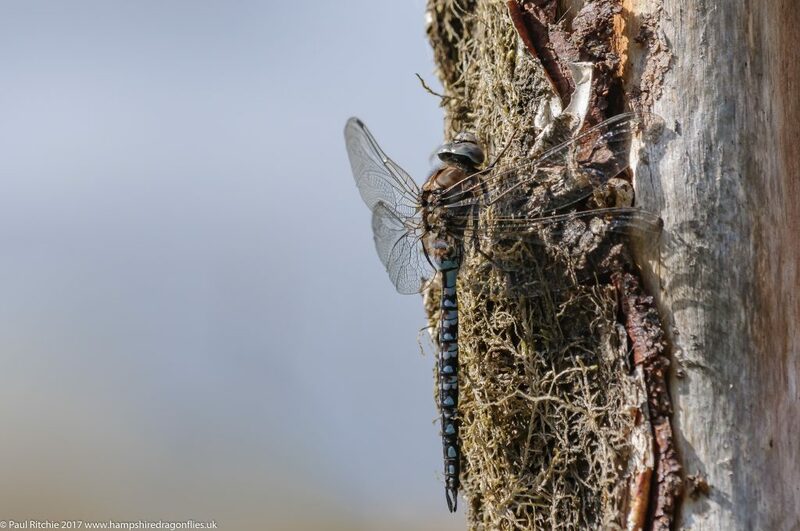 It wasn’t long before he too flew out of reach and opportunity so I took another stroll around the pond, stopping a while to observe e female Brown Hawker ovipositing into the perfect log. That’s a long trip for little reward, but I’ve had worse. I shall return! 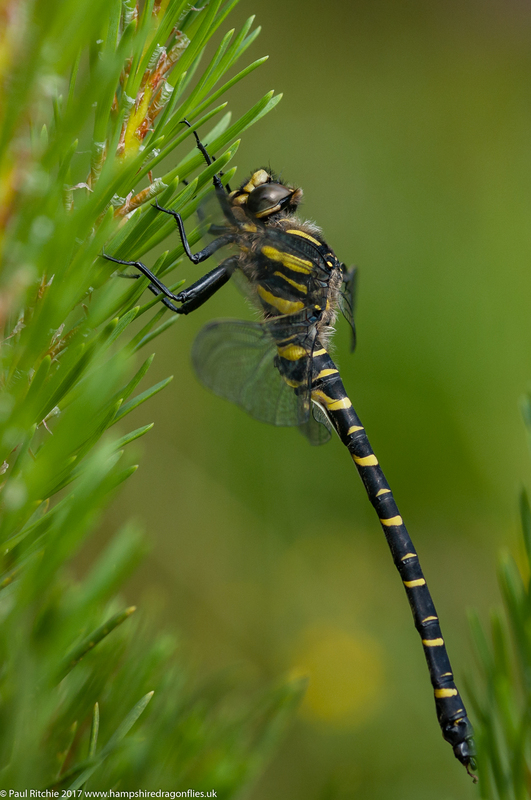 Given some unusual good weather I met up with Richard Peglar to the New Forest delights and to locate a few of his most wanted species. The Keeled were the first to show just in from the road with a couple of males present, closely followed by Beautiful Demoiselles, Southern Damselflies and our first of several Golden-ringed. Such was the amount of activity that it took a while for us to reach the key area where an Emperor was holding court over the pool – a different individual from two weeks prior as this one didn’t have a leg dangling down! The Keeled, although plentiful, weren’t as dominating as a fortnight ago but they were still in good numbers; even a few tenerals still rising from the heather and the occasional female. However it was the Golden-ringed who really impressed with about a dozen separate individuals present between the bridge and the mire. Southern Damselflies were in good numbers and there were reasonable numbers of Small Red – quite a few paired up 50+ metres uphill from the stream canoodling in the heather. 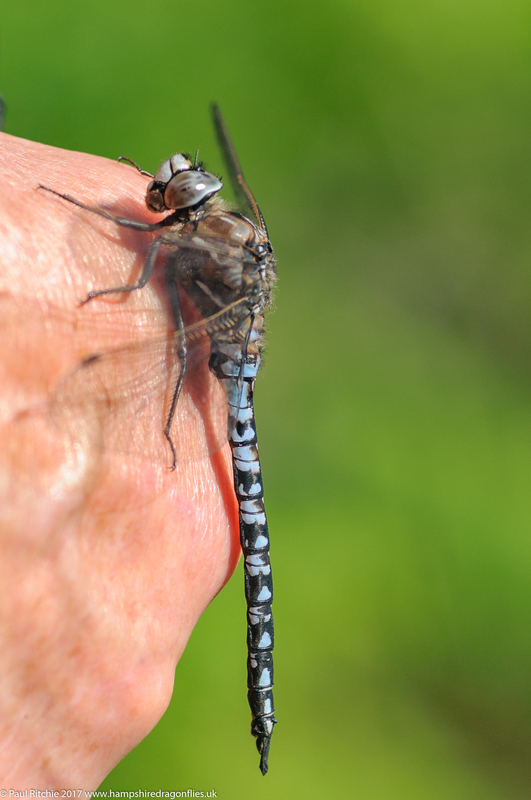 Needless to say Richard was more than satisfied on the species on offer, and a quick look in at Ipley Cross provided some Black Darters for us both to add to our yearly – or indeed – life list. Today it was a guided tour around Bramshill. I had received an email from Terry Walker who despite having spent several days at the site he’d barely encountered a thing and decided a few pointers were needed in field craft. Barely down the track we encountered Beautiful Demoiselles in their usual sunny corner, along with the usual supporting cast of Common Blue and Blue-tailed. 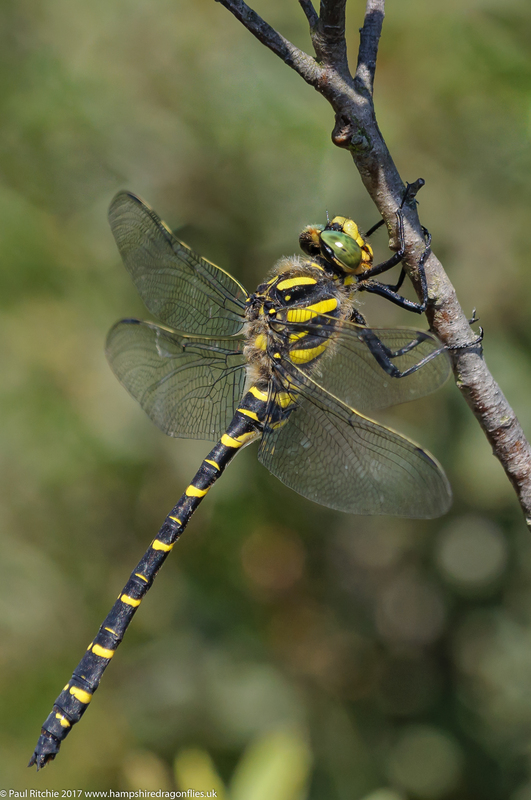 The grassy track provided perfectly today with male and female Emperor and immature Southern and Migrant Hawkers feeding along the treeline; the latter two stopping to perch, and a pleasing bonus for yours truly as these were my first sightings this season. Of course the problem with gorse is it rarely provides a golden photo opportunity but I was happy enough to grab a couple of record shots until later when both will be more agreeable. Next a tour of the pond clearing, which is desperately overgrown and in need of a shave, or failing that some more foot traffic to keep the vague path clear. 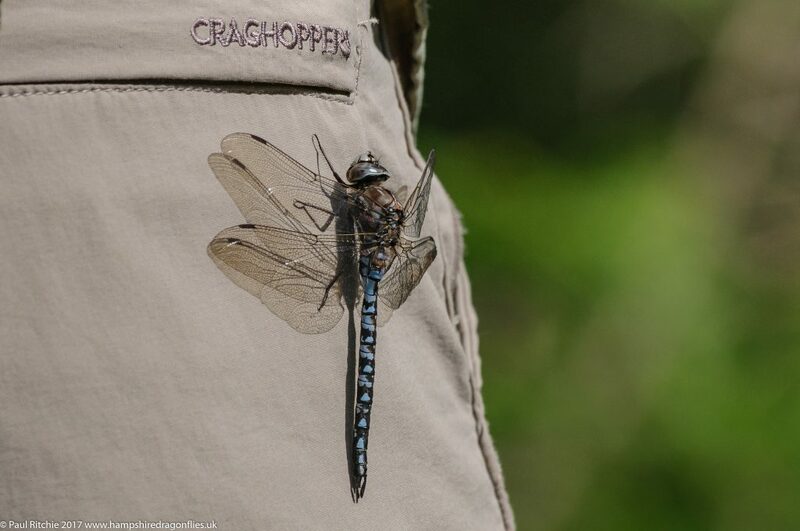 A couple of Brown Hawkers and Emperor were present along with Azure, Common Blue, Emerald and Blue-tailed and at the green pool they were joined by Black-tailed and Keeled Skimmers, Common and Ruddy Darters and a male Broad-bodied Chaser. 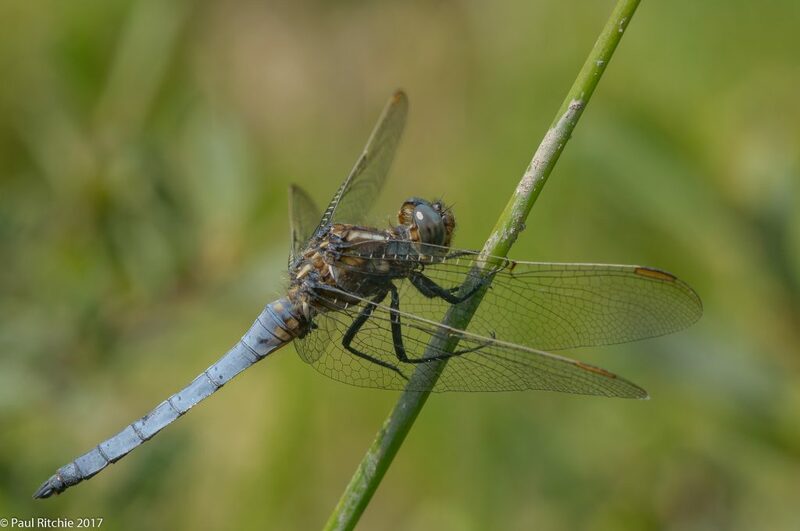 At Long Lake the Black-tailed Skimmers were way down on numbers but still enough to keep the interest up while more Common Darters and the odd Migrant Hawker paraded down hawker alley. 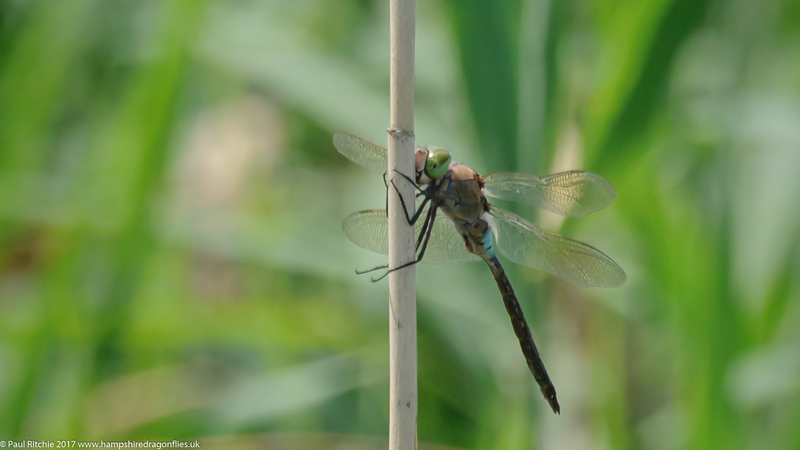 At the shore we made our way along to the rushes admiring the over-water activity where a couple of hardy Four-spotted Chasers were hanging on in there with a tired Emperor and equally subdued Brown Hawker. Across the lake more Chaser, Skimmer and even Darter action sharing space with a male and Emperor and a female Brown Hawker ovipositing into the shady shallows. 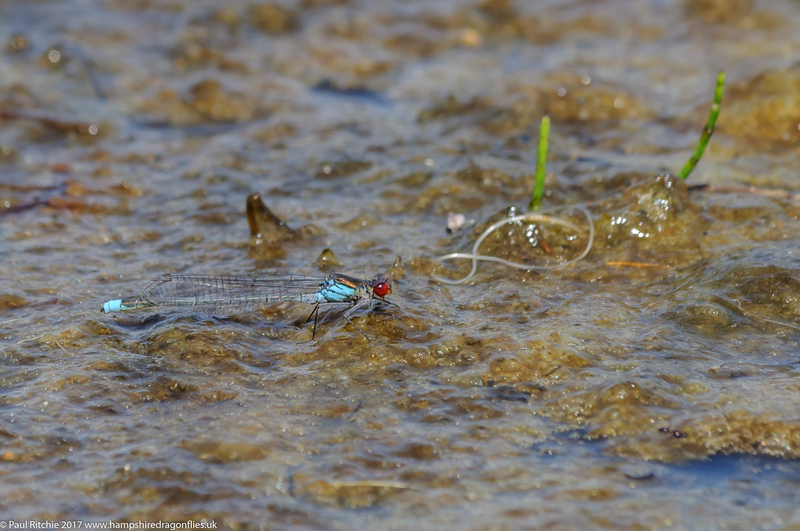 Besides the swarms of Common Blue and plentiful Emeralds were both large and Small Red-eyed damselflies, perfect for showing the difference. Needless to say Terry got to appreciate the wonders of Bramshill by taking a little more time to explore and the Southern and Migrant were a nice bonus for yours truly. Now all we need is a little more sunshine so I can get out and indulge myself. A break without the modern convenience of email, phones and the web was actually precisely what a holiday should be. However it’s taking a while longer than I thought to get back into the swing of things. I took a foray around Bramshill to clear the mind. A little too early for the ponds but I gave it half-an-hour just in case anything interesting flew in before moving on to Long Lake. 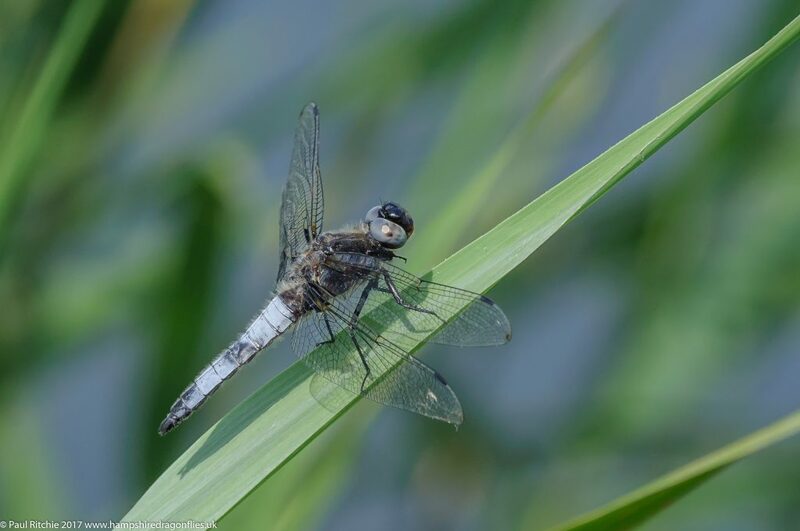 The seasonal Black-tailed Skimmer swarms along the path had diminished, but plenty of them over water along with Emperor, Brown Hawker, Broad-bodied and Four-spotted Chasers, Keeled Skimmer and the usual damsels including Small Red-eyed. I placed myself at a favourite spot. offering shade in case I needed it, and had the twin blessings of Emperor and Brown Hawker and all manner of cracking activity to enjoy. A truly marvelous spectacle just watching nature at it’s finest. Afterwards I took a walk to the Brilliant Emerald pond and observed a male patrolling briefly along the far shore before carrying on a little to the spot I’d seen the female a couple of weeks back. A male Brown Hawker and Emperor were using this section to feed and I hung around for half an hour just in case. I returned to Long Lake where the wonderful sight of a dozen or more Brown Hawkers feeding from head height to the treeline was magnificent. I did wonder where they were all perched before I disturbed one, causing a chain reaction I’ve noticed with this species before. Once one is up, they all get up to confuse any prospective predator. A marvelous survival tactic utilised throughout the animal kingdom which really does mess with your focus. But oh so excellent to observe! A nice, gentle day at Crockford seemed the ideal alternative to walking miles. 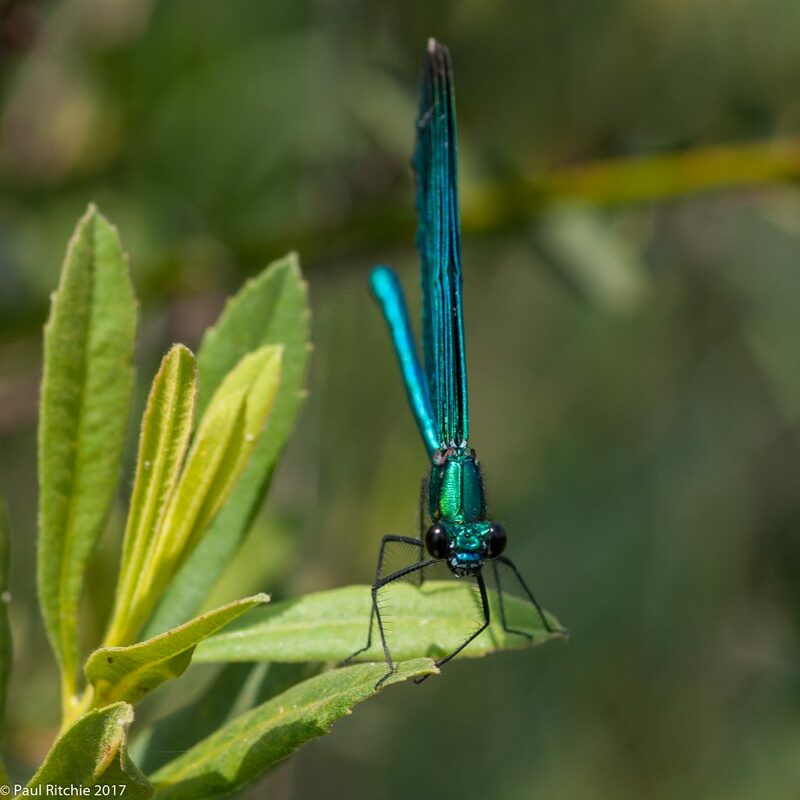 There weren’t as many Keeled present as two weeks ago, but they still dominated the stream along with a few Broad-bodied Chasers and a smattering of Southern and Small Red Damselflies and Beautiful Demoiselles. When I reached the ford I expected to find a Golden-ringed present but it was an Emperor which grabbed my focus, holding a small territory over the pool. I spent a good while with this fellow, allowing him to get used to my presence until he allowed some close and unusual opportunities. 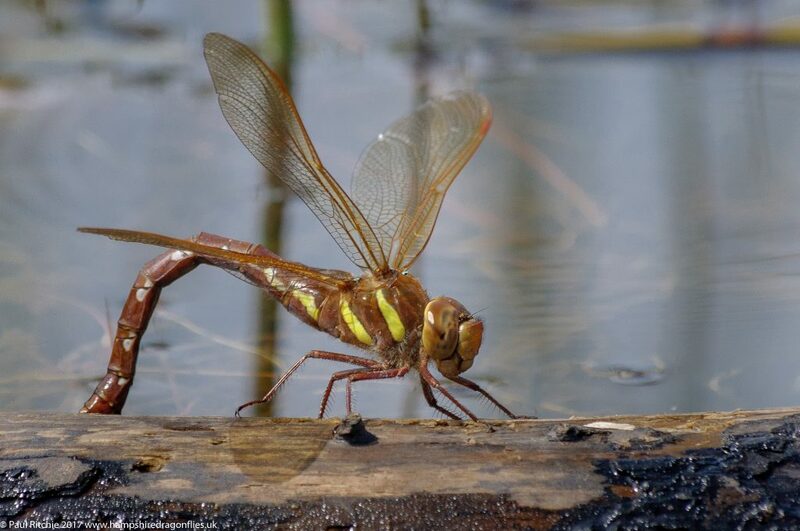 I was again alarmed by the lack of Golden-ringed present; only the one holding territory further upstream, so I decided to walk to my favourite spot where a few teneral Common Darters were present and a couple of Broad-bodied Chasers vied for territory with the Keeled. There was one Golden-ringed present up here, choosing to lay low among the gorse stand, occasionally popping out to battle with the Keeled along his chosen stretch of the stream. All rather stilted though. Even the resident Beautiful chose to remain perched, only disturbing his rest when a female flew in briefly. Both days rather short on opportunities. Hopefully things will pick up soon and I can get back to some home-grown indulgence. Our second full day turned out to be rather glorious, with sunshine and suitable warmth handicapped by a strong, cold & biting breeze from the south. This was annoying, because the areas I intended to search for the Northern Emerald felt the full blast. I looked around the burn and loch north of Slatterdale. Under these conditions I didn’t walk in as far as I could have done. We stopped at Victoria Falls to take in the view, our eyes always peeled. At the Bridge of Grudie there wasn’t an expected car parking area as such, unless you parked where the workmen were, or in the gap on the bridge as we did. While Sue stayed in the car I looked in the clearing to the north and along the stream to the south, but the wind really was a problem. I found a good few pools which looked ideal, but you would need to camp out and hope, and in this wind there was no chance. Only Large Red were hardy enough to be present here today. Close to a car park there is a spit of land which juts out from the road towards Loch Maree which contains a few boggy pools, except today they were devoid of shelter and flying creatures. We decided to have a cuppa and a Cornish Cream Tea at Kinlochewe services before we met up again with John and Carol at The Beinn Eighe visitor centre. In my eagerness I took a quick scout into a clearing and wished I hadn’t. The ground was uneven with hidden depths which threatened to swallow me up at every step. Educated by this episode I returned to the car park for John & Carol’s arrival and we took a walk south, pausing at a pond to admire the few damsels under what now was the mountain’s own generated weather system. Reaching the section of path we’d been advised was a haven for basking dragonflies we despaired as this angry black beast of a cloud hovering overhead was fringed by perfect sunshine. And that wind! Still, the views were nice, and we did encounter a Golden-ringed situated in a sheltered hollow. 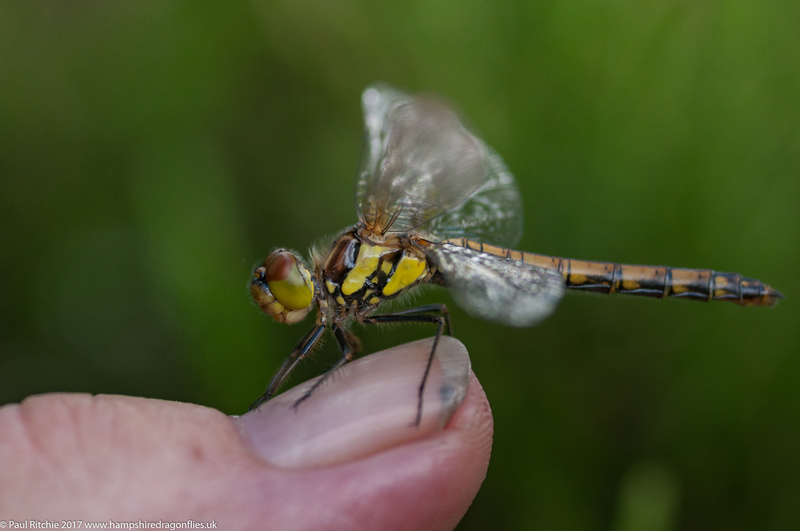 Realising this cloud was here to stay we moved west and took a stroll along the official Woodland Track, passing another perfect dragonfly sanctuary had conditions been more favourable. By now we were desperate as the day was waning. One more try at Slatterdale where at least we found the sunshine. Taking a walk up the path despondency was setting in, knowing this would likely be the last day we’d have to find our prize. We found another Golden-ringed and willed it to turn blue before Sue called from back down the path. Well done hun, you’d found them! 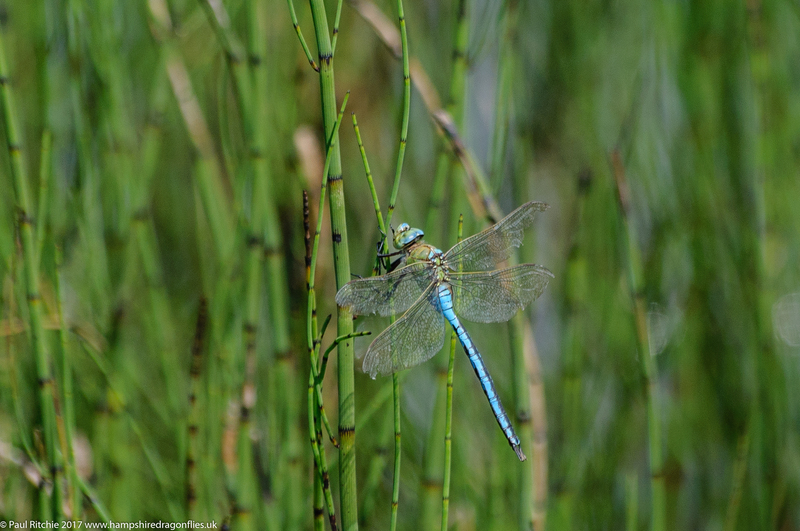 Two male Azure Hawkers were basking on the logs and rose at our presence, giving us a wonderful show before one disappeared, leaving the other male to delight us as he circled us, eventually taking turns to land on each of us before returning to his chosen log or one of the few trees left standing. To say we were overjoyed is well short of the mark. We were ecstatic! Considering how hard we had worked we did feel we deserved this encounter. For forty-five joyous minutes we indulged, relishing our time with this fabulously gregarious individual. Although we naturally felt honoured that he chose each of us as a perch the reality is he needed our warmth. When he returned to the log, and shortly after this capture, he bent his abdomen down to maximise the contact area. Possibly the best capture was attained when he became a badge of honour for John. After we fulfilled every opportunity we could we let him be and went our separate ways; John & Carol back to the campsite while Sue & I took a drive to Red Point to take in some glorious Scottish scenery, watching the sun throwing shadows over the Isle of Skye and the mountains of Applecross.. If you can believe it there was actually a Golden-ringed flying around the car park, totally where you wouldn’t expect him to be. A bonus, perhaps, to what turned out to be a fraught but eventually fulfilling day. 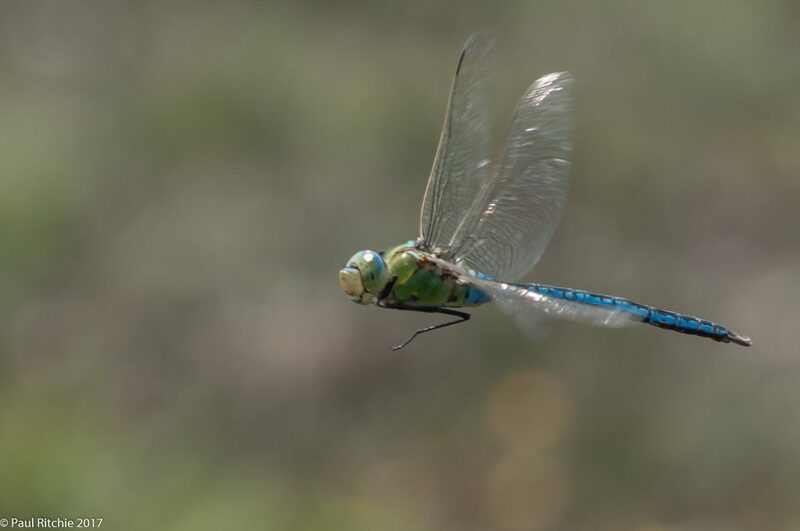 At the end of last year Sue & I promised ourselves a trip to Scotland in search of the Northern Emerald and Azure Hawker. 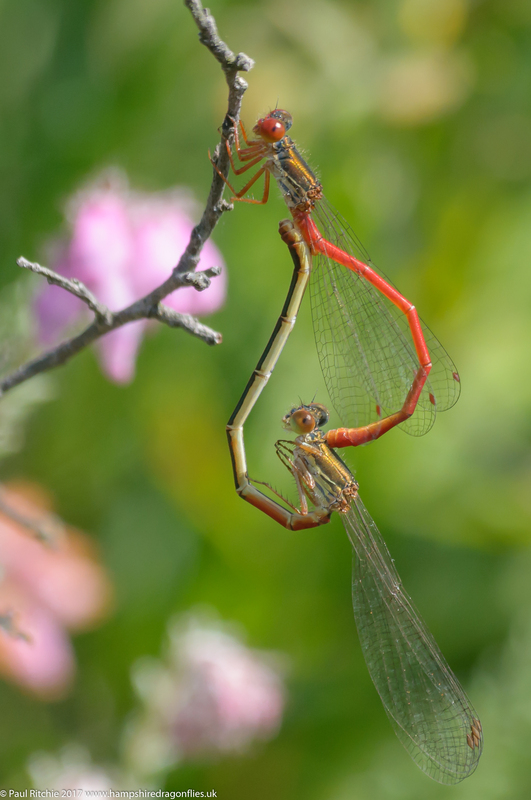 The Northern Damselfly could wait for another time. We gave ourselves three days in the hope that at least one of those days would bless us with sunshine. Friends of ours chose three weeks! Our first two days of the holiday involved the long journey up; stopping over near Loch Lomond to take the scenic route to Gairloch the next day. Arriving late afternoon we took the short drive to Flanders Moss under dull & windy conditions. The circular route along the boardwalk includes a couple of ponds and several shallow boggy pools which would be ideal, however nothing was flying under these conditions at this hour. 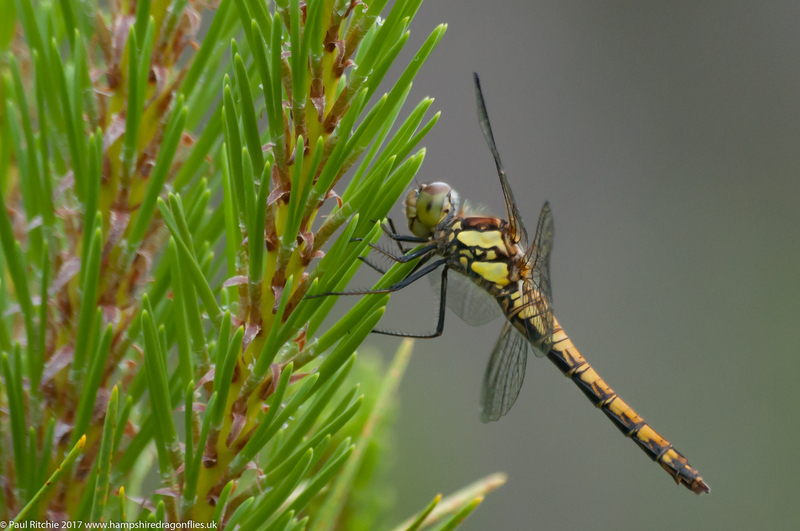 We saw our first Odonata during our drive at the top of Loch Lomond – just a Large Red perched above a small burn at the back of a car park. The drive up through Glencoe and Glen Shiel was exhilarating with fantastic mountain scenery throughout. A bonus was an Osprey chasing Oyster Catchers over the loch at Strath Carron. Our wonderful day soon disappeared into farce when we found our chosen hotel was less than perfect. Beautiful enough, but tired and jaded with possibly the worst Wi-fi reception and no phone signal! Having no phone meant we couldn’t connect with John & Carol who were staying at a campsite in Poolewe, so we took a drive out in the morning to find them walking down the road to the local cafe! A perfect serendipitous moment. After greeting over a cuppa we went back to their caravan for a spot of lunch and drove out to Laide Wood, a bonus location Sue & I had found about about via Gairloch Tourist Information. 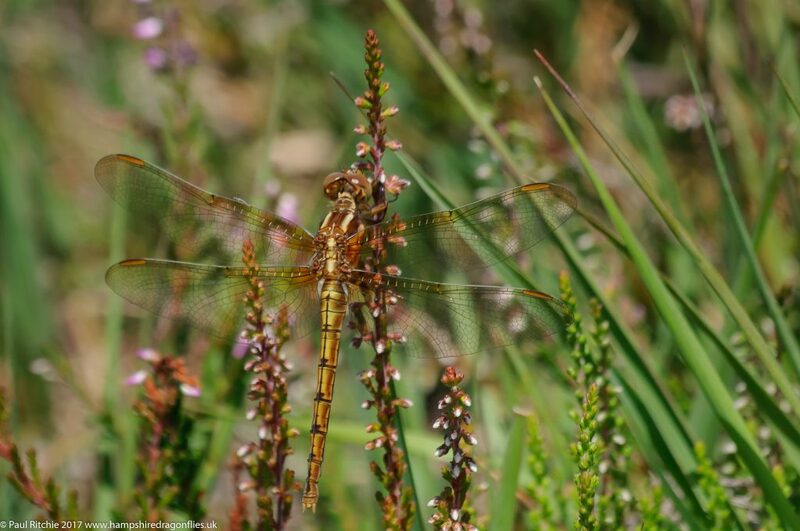 The weather was far from perfect with a wicked wind, but the sun did appear briefly and we had a sighting of a Highland Common Darter female along the path. 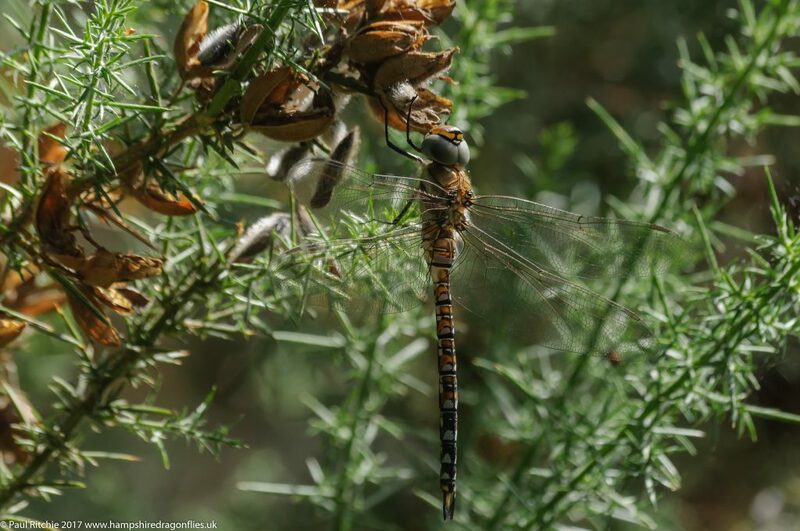 Our walk brought us to a pond surrounded by conifers which produced a few damsels and carried on to a fabulous pond where we found another teneral female sheltering in the heather. Such was the strength of the breeze passing through the trees that she was swaying uncomfortably, so I gently coaxed her onto my finger to find a more sheltered spot before leaving her be. 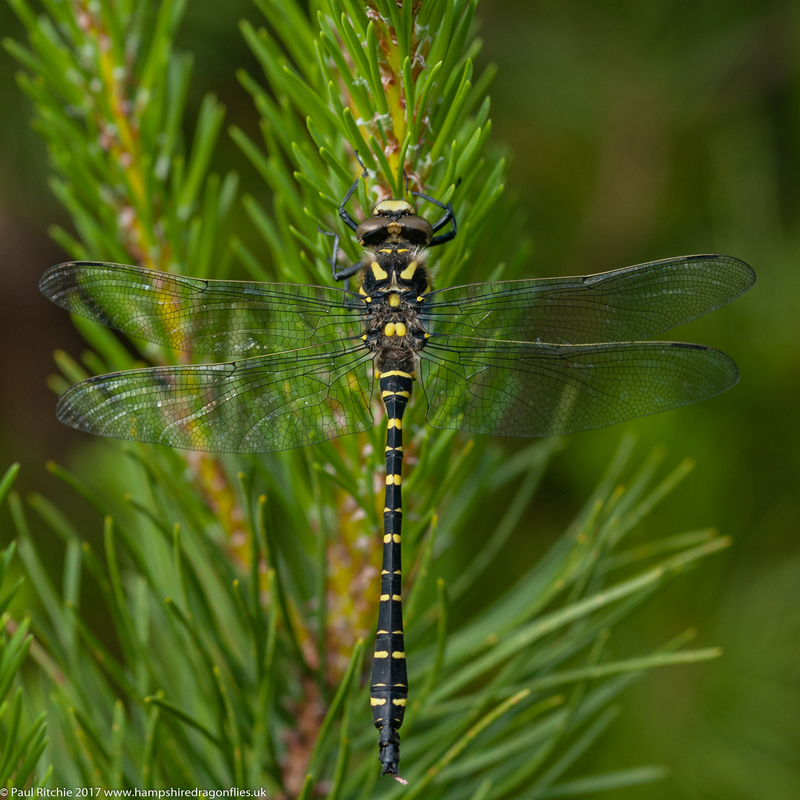 We had another Highland Darter before getting a glimpse of a Common Hawker flying erratically around the margins feeding during a rare sunny spell, and waited impatiently for another. Shortly afterwards we encountered a pristine young Golden-ringed perched on the pine saplings. 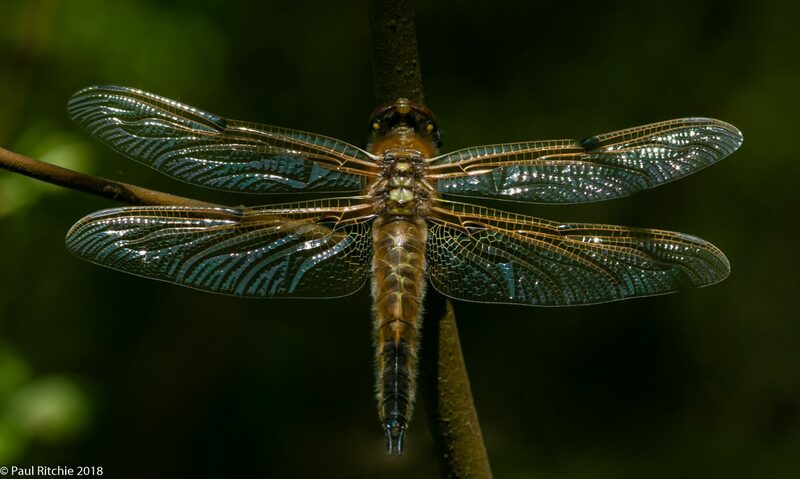 It’s a large dragonfly. It’s a Golden-ringed. It’s perched and we were short on opportunities! 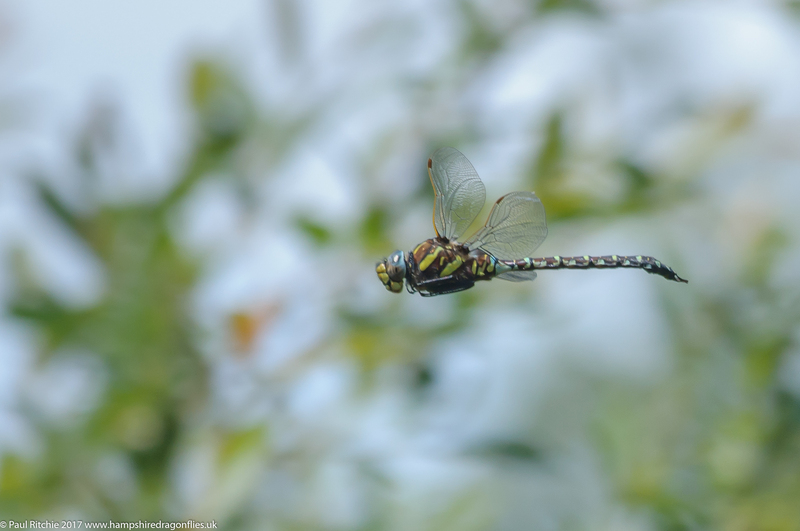 By now it was getting late and just as frustration set in we had a hawker fly in for a marvelous, fast and elusive display before he perched just long enough for Carol to grab a shot, which later turned out to be another Common Hawker. We wished we’d had better conditions as this place is just perfect to spend a few hours. 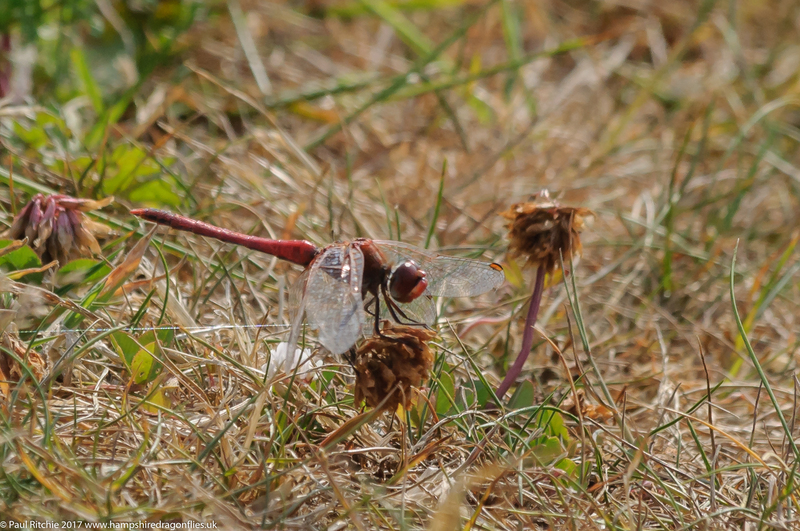 With the many reports of migrants entering the country over the last few weeks; Red-veined Darters and Lesser Emperors blown over from the continent with the current warm front, I would have been foolish to act on a report of both present at Longham Lakes on Tuesday. 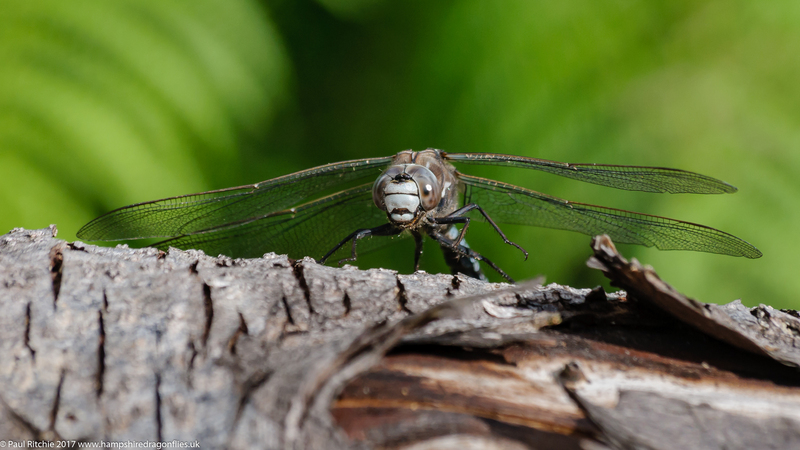 I try to pay a visit every year or two if I have time and given good reason I headed out early to be greeted by a Red-veined Darter halfway around the lake. Skittish as usual I managed a record shot before carrying on to the group of eager twitchers who had also seen the report. After exchanging greetings and hearing reports that they think they’d had a sighting I carried on over the causeway intent on having a look at the small ponds where I know RVD have frequented regularly in hopes of getting a better opportunity, but it wasn’t to be. The most dominant species here and around the lakes were hundreds of Scarce Chasers. Back at the throng there was still no news so I carried on a little further to where a (Blue) Emperor was patrolling, eager for a rest and a good drink in the increasing heat & humidity. Mid-swig I saw my quarry come in for a brief battle with the Emperor and return for more shortly afterwards. A couple of brief glimpses and I was surprisingly content. Knowing I had a meeting after lunch I decided to take a slow walk back to the car when I bumped into Chris Dresh who was also here on the promise. I confirmed I had a couple of sightings and while he made his way to twitcher corner I continued my slow walk only to be halted immediately by the prize giving a good display over a small fishing stand. Calling Chris over we watched and attempted some shots glorious in the long moment that was obviously just for us. 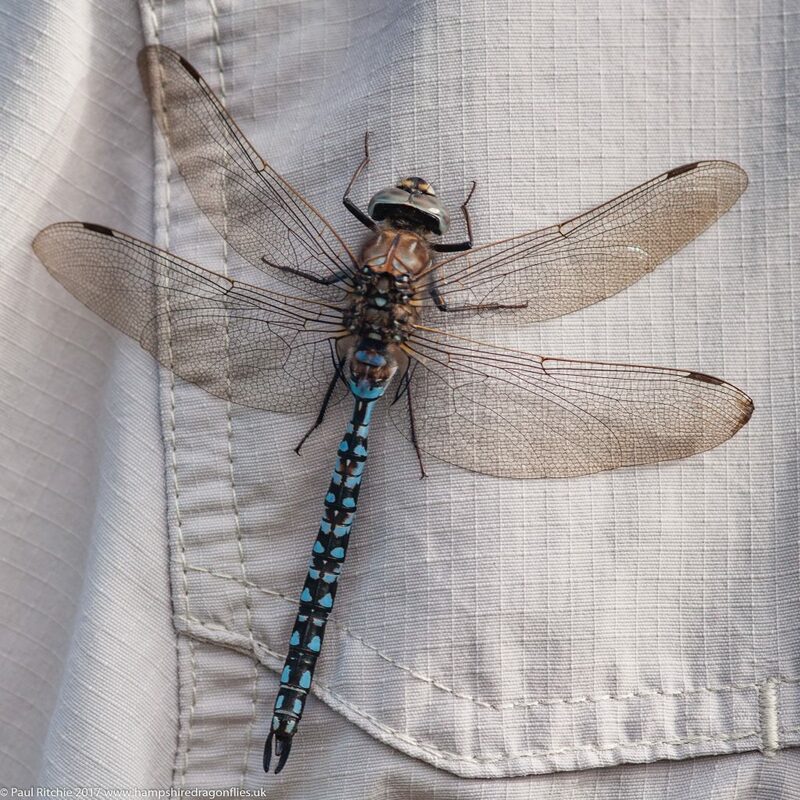 After a marvelous display he disappeared out of site and we carried on walking in different directions until I looked back and noticed Chris and the group doing the dragonfly-dance. About turn – I’d be foolish to leave now. Sure enough, when I rejoined the group there was the Lesser putting on an even better display than our earlier one. Magnificent, and unencumbered by the resident Emperor who had sodded off I presume for a siesta. Eager shooting and this time I knew I had a shot in the bag. As if this magnificent flying display wasn’t enough our merry migrant even perched among the reeds briefly. Alas not close enough or long enough to get anything better, but I didn’t mind. For once a plan had born fruit, and when our prize left us I reluctantly called it a day. Duty called.